Disclaimer: This post is sponsored by the Northwest Arkansas Technology Summit and its partners, NWA Tech Council and the Greater Bentonville area Chamber of Commerce. I was invited to attend this conference in exchange for social media promotion of the event. All opinions are my own and recollections of the event are reflective of my experience. I recently attended the Northwest Arkansas Technology Summit, which was held at the John Q. Hammons Convention Center in Rogers. You may have noticed my Facebook and Twitter accounts blowing up with information during that time. This was my second time to attend, where I was able to learn about technology in the workplace and to share what I learned on social media. I was not surprised to find out that the attendance for the event has grown from 400 to 1500; it was obvious looking around the main ballroom that people were excited to be there. This year, organizers even added two days to the event, to include a day targeted to women professionals in tech and another day labeled as a makers summit. I particularly enjoyed the morning keynote presentation by Michael Troiano, who is the VP-IoT, of AT&T Business Solutions. He shared some interesting figures that really got me thinking about how technology, and specifically the internet, have such a big role in everyday life. In our personal lives, we are connected not only through our phones, TVs and cars, but now we are able to control our thermostats and view our home security systems when we aren’t home. City governments are improving efficiency by doing things like providing some workers with Wi-Fi in work vehicles and controlling street lights. Troiano told us of a study that says by 2020, there will be more than 35 billion devices connected to the internet. Guys, that’s four times the number of people in the whole world! Can you imagine? 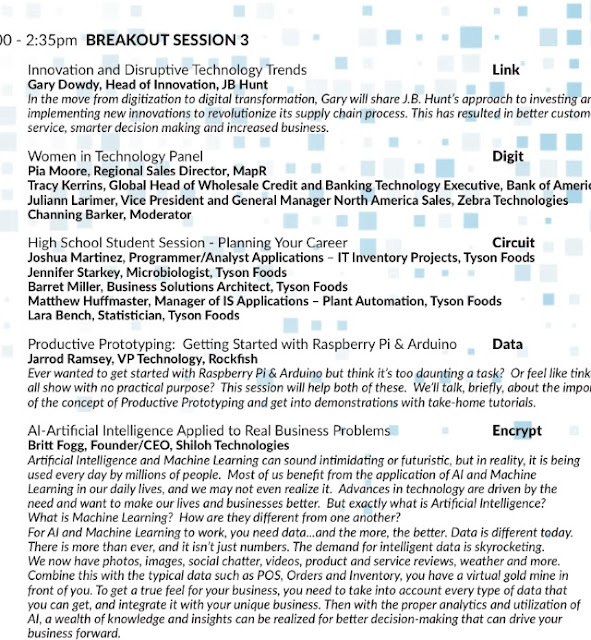 As I looked through the agenda (online, of course! ), I found it really hard to choose which breakout sessions I wanted to attend. Now, more than ever, I realize that it’s important for me to keep learning new things to improve my job skills and be more marketable as a potential employee. 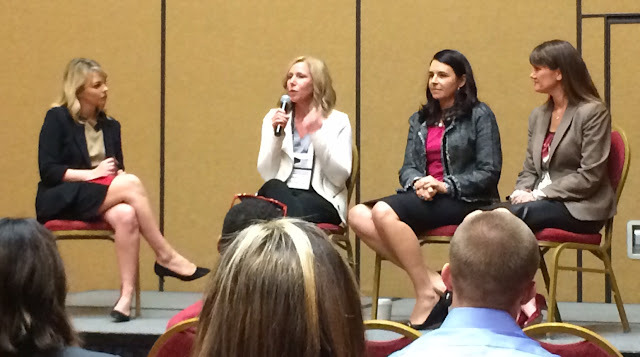 One of the sessions I attended was a panel discussion led by three women in the tech field. They each spoke about their careers, how they came to them and how they continue to change. The women stressed the importance of getting girls interested in technology early in life. In fact, studies have shown that girls are equally as interested in technology gaming, building and designing as boys are. Girls do think math is fun and cool, despite the old stereotype we know. The problem is that at a certain age, most girls decide that they don’t want to show that enthusiasm or interest in math in front of boys. One of the panelists said this is a reason that some schools are starting to separate classrooms so that boys and girls won’t be distracted or influenced by the other. I’m not sure my opinion on this, but it’s certainly worth reading about. I had a great experience at the Northwest Arkansas Technology Summit this year. I’m super proud that I have so many friends involved in the planning of the event, and who support the event. I’m even more proud of the girlfriends I have in the technology field. They are all doing important work and being strong role models for girls just like mine.